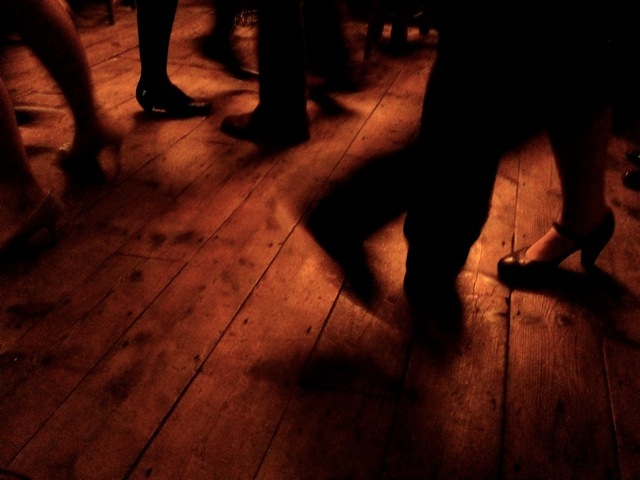 How do movements and dance in particular have an effect on our physiology? Do we think with our bodies? From our sexual drive to how memorising dance moves can help stimulate neural paths in our brains (proven to be beneficial for people suffering Parkinson disease), Dr Peter Lovatt (see him here) facilitated an evening in the in the context of a School of Life event where he unravelled some beguiling insights to research being done between dance and well-being. For sure, I’m convinced that we humans need to dance to be well. Unfortunately we are still far from creating everyday practices where dance for example becomes a staple to our daily regimes. Indeed, in our seemingly hyper cognitive world, residing on our western culture, we still linger on this dichotomy between body and mind. Even if the neuro-scientists are more and more proving how our brains: complex and interdependent organisms, rely on the ‘emotional’ and ‘rational’ parts to function well and sanely, the societal structures preceded by those who we let run our societies, still fear the arts and the basic building stones of culture. Imagine if executives in organisations or politicians used dance as a strategic decision-making tool? 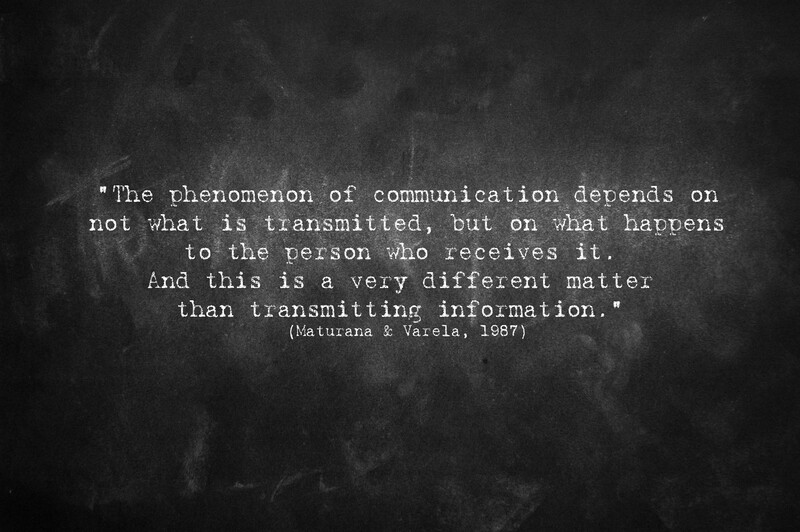 Think, what would happen if in our curriculum at school, we all had to learn to tune-in and find our groove? We’d have to connect more to our embodied understanding of the world, our intuition, and lo and behold – negotiate more from a situated position. Now that’s a thought that gets me swinging, rocking and stamping. 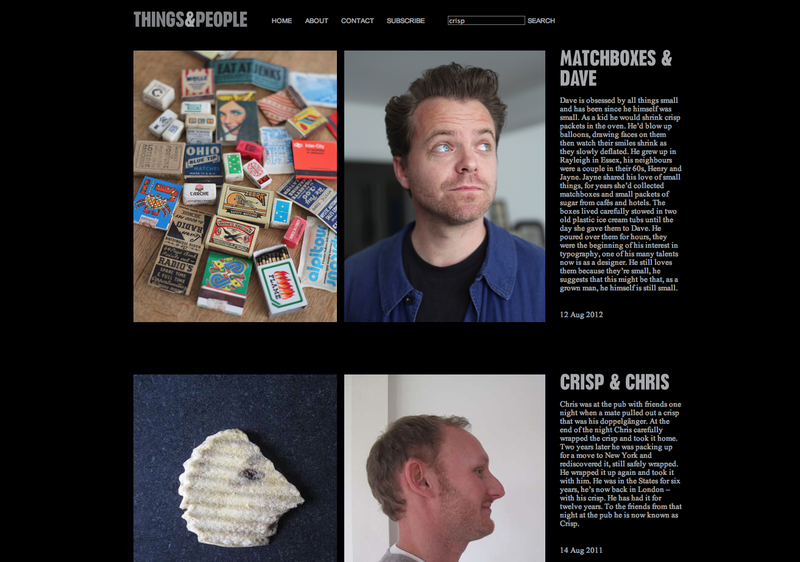 Things & People is a lovely project that aims to show what things mean to people. In a world of hyper consumption, this project speaks strongly to me as it seeks to render visible the material connections we have with certain objects, perhaps banal to others but nonetheless each object tells a story; gives associations and uncover feelings. The objects offer an insight into their owners and their owners offer an insight into the objects. Each story portrays the owner and the object where the photos are taken at the person’s home. Sandy explains how the project developed from a small book that she designed for the tenth anniversary of her sister’s shop. You can subscribe to the blog and get regular updates on new stories. Munch & Hirst – commonalities? So what does Edvard Munch’s and Damien Hirst’s work have in common? Currently the Tate Modern is showing two major retrospectives of the two artists, one floor above the other – with a hundred year between them (Munch was born in 1863, and Hirst in 1965). 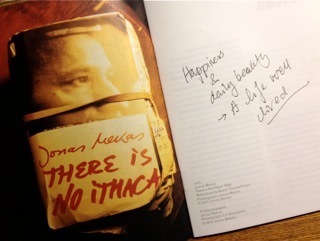 Both turn of the century artists – Munch (20th century) and Hirst (21st century) have become iconic artists of their times. Having seen both shows one after the other the superposition of the two became interesting to query. What is it that they as artists catalyse of their time? And, are there communalities to be found? Both artists are indeed solipsistic; preoccupied with morbidity and death; compulsive as they replicate certain motives over and over again, like Munch’s Weeping Woman 1907-1909 or Hirst’s series of Spot Paintings. Munch’s world feels introvert and one can ask if to some extent they work as a self-healing agents? In Munch’s time the Spanish flu, tuberculosis and other illnesses ravaged, and the experience of this is exemplified in The Sick Child 1907. Munch’s expressionist style typically coincides with a time of painful existentialist questions as well as the drive for liberation of the self. One hundred years later, Hirst’s medicine cabinets filled with pills in e.g. in Lullaby, the Seasons 2002, fills me with a sense of anaesthesia, and yet so adequately exemplifies our era of blatant consumption of pharmaceuticals. The slickness and manufactured gleam of Hirst’s work is in deed spectacular and renders us viewers as voyeurs too. And what does that say about our current times? The funny thing about aesthetics is that one can like or dislike. Yet, taste is arbitrary, and aesthetics is much more than a matter of taste – it is a system for perception that in many ways encapsulates our time like a pulse or a litmus test. So whether one likes or dislikes, both these artists are undeniably iconic of their times. Aesop's fables at Birmingham Central Library. We live in a time when the role of libraries and books are changing with the advancement of digital media. Some believe libraries will shift into learning and information centers, others insist that they will continue their role in storing and loaning physical books alongside enabling access to information technology. Whatever happens, providing the access and freedom to read is essential. 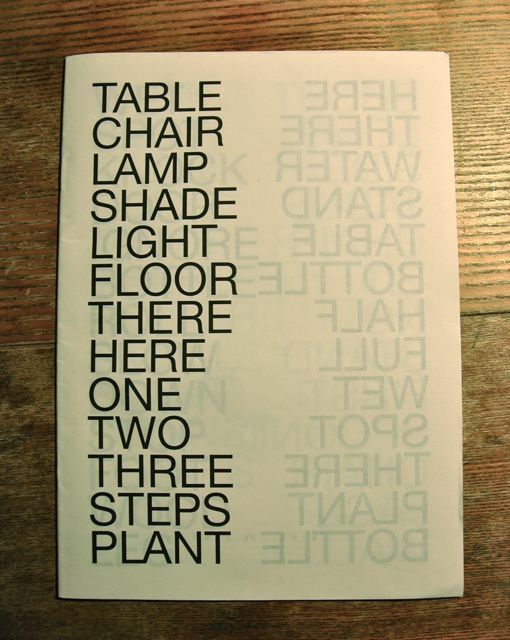 Inspired by Ray Bradbury’s science-fiction novel Fahrenheit 451, Mette Edvardsen has created a performance project: “Time has fallen asleep in the afternoon sunshine”, that has reading and memory at it’s heart. Bradbury’s novel is set in a future where ‘ignorance is bliss’ and books are forbidden as they are considered dangerous. 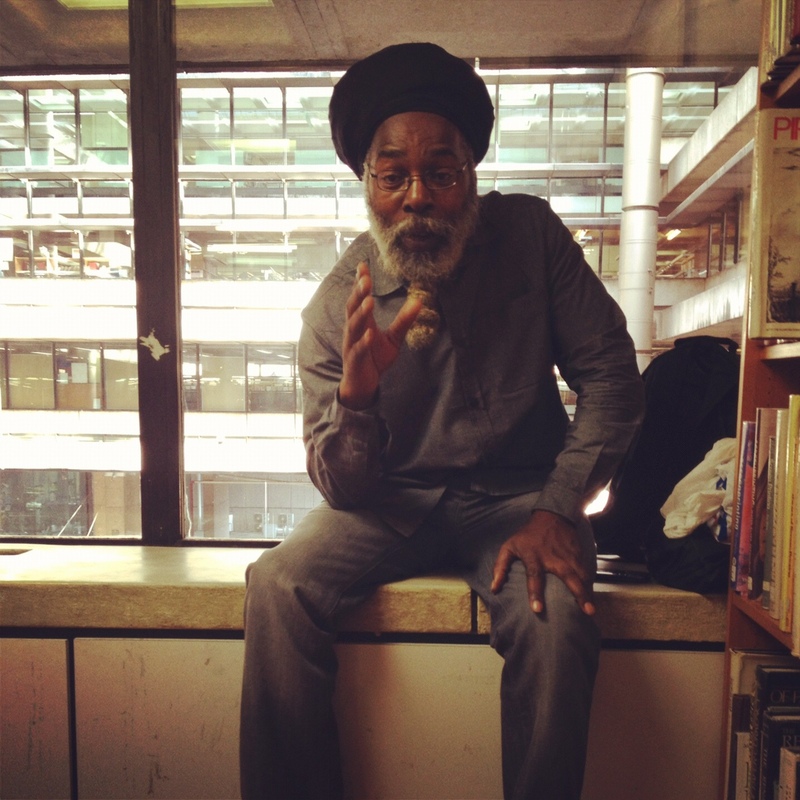 Yet, an underground community of people learn books by heart in order to preserve them and pass them on for the future. For this project a group of eight people/ performers have each chosen a book and committed to memorize it. The performers become their book for the time of the reading, as they recite the memorized stories to their solo audience. The performance is a constant process and as Mette says: “there is nothing final or material to achieve, the practice of learning a book by heart is a continuous process of remembering and forgetting.” During the Fierce festival anyone can come and consult a book of their choice and experience a reading session at the Birmingham Central Library. Forgetfulness is relentless. History has a few patterns to show for that. To memorize we have to go back again and again to the source. But with lived memories we cannot go back to the source. So how much of our memories become mere reinterpretations? Like xerox copies that loose definition and become fuzzy the more we copy a copy. Whilst written books provide a source to refresh our memories, to remind ourselves and to reconfigure interpretations; Mette says: Books are read to remember and written to forget. It seems like an ongoing cycle. So is practicing memory futile? Some might think the same of poetry and storytelling. Where do your clothes go, once you’ve given them to a charity? Everything Must Go is an exhibition that seeks to make visible and tangible some of the flows of textile waste. 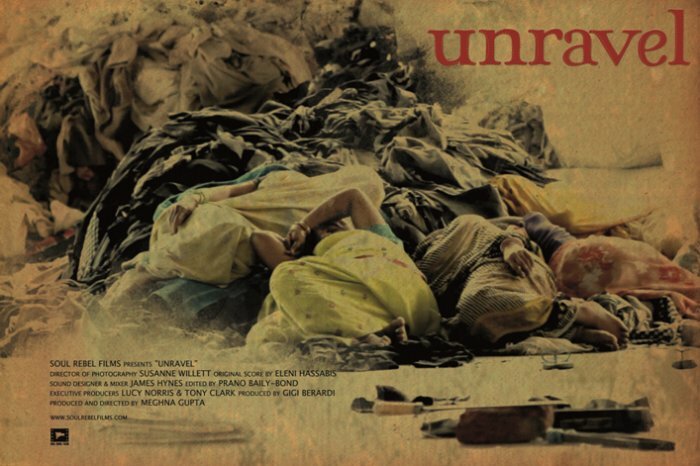 The screening of Meghna Gupta’s debut film Unravel in the exhibition shows the journey of clothing waste from the UK to Panipat in North India. Here we meet some women in a textile recycling factory who work to dismantle the garments and shred them so that they can become recycled yarn. What is truly touching in the film are some of the testimonies that Reshma and her co-worker’s share in their encounter with certain western garments like, a swimming suit or embroidered underwear. With limited exposure to western culture, the garments fuel their imagination and preconceptions of western lifestyle, bringing both a sobering and humorous rendition of what ‘our’ clothes might say about our western lives from afar. The exhibition and film definitely provided some food for thought into consumption patterns in clothing. 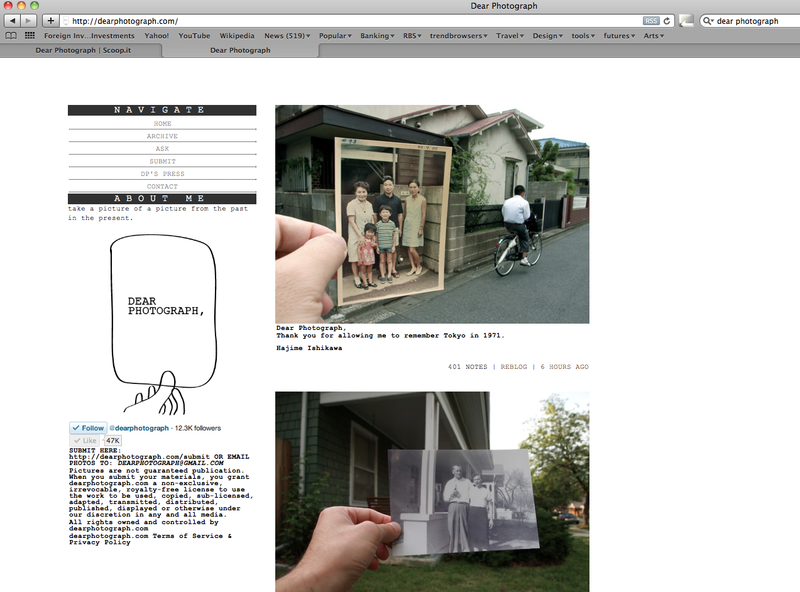 Dear Photograph is a blog project that invites readers to ‘ take a picture of a picture from the past in the present’. A simple yet very evocative concept using snap-shots. Everyday a new photo is posted, and great to see how people get involved and send their pictures in to share. The reptition of the method turns the collection into a shared family album as the pictures tend to trigger familiar memories by proxy. Funnily enough many of the everyday scenes offer new memories to adopt. Many are nostalgic, many pay tribute to someone and some are just incredibly iconic. The caption obviously each time is like the first line of a story that we can continue to imagine. At times it’s rather uncanny and touching.